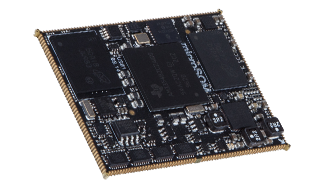 Exor International is launching uS01, TI’s Sitara ARM-Cortex-A8 based microSOM standard, for the increased system performance requirements. The ARM Cortex-A8 allows greater flexibility for the system designers and helps to lower the system cost and power consumption. The microSOM includes Exor JMobile and Linux runtime, designed to optimize the performance and the memory size, running the Embedded Linux on ARM-Cortex-A8 platform and programmed by JMobile Studio, using optional CODESYS 3.x development tool for SoftPLC control applications. The microSOM is soldered directly onto the main carrier board, without using of expensive connectors, that will increase reliability of the system. With only 46x35 and 4 mm in height microSOM allows you to design products extremely compact and ultra-slim. The microSOM requires a single supply of 3.3V with very low power consumption. It provides the combination of pheripherals for performance and power savings, but with the great flexibility allows to configure different products. A Powerfull Video Contoller and JMobile HMI software enable to design a User-friendly and high quality vectorial graphic (SVG) rich-graphical GUI and assure a device connectivity with suite of +200 communication protocols. The Exor microSOM Product Longevity program ensures a stable supply of products for your embedded designs. microSOM products are available for a minimum of 10 years from product launch and are supported by standard end-of-life notification policies.